The Student Labor Action Movement held a discussion on Nike’s poor treatment of workers in Indonesia and urged NYU to sever ties with the company. 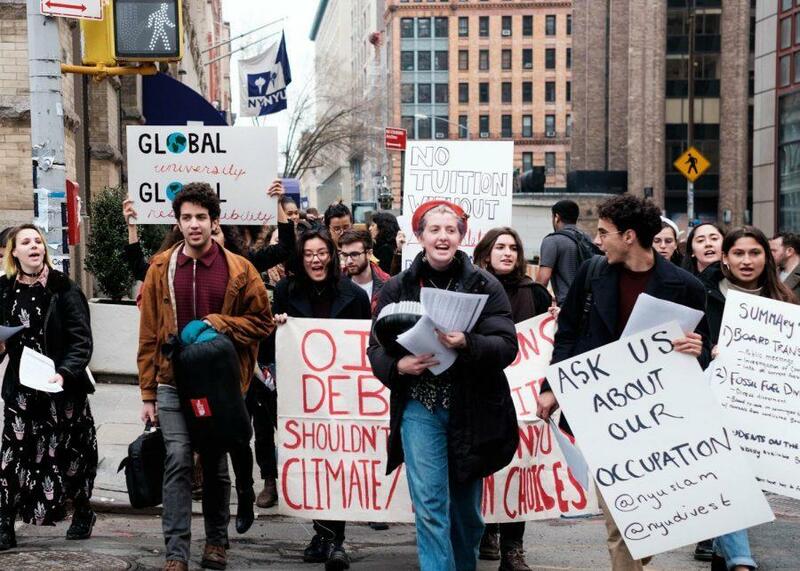 NYU students at a Student Labor Action Movement protest. Student activists discussed at an event on Thursday Nike’s mistreatment of workers following the company’s withdrawal from Indonesia and decision to provide minimal or no severance pay to Indonesian workers in 2011. Two Indonesian union leaders scheduled to speak at the event — Linda Ratnasari and Siti Chasanah — were unable to attend after the State Department denied their visa applications, according to SLAM members. The student organizers instead presented the stories of Ratnasari and other workers through video and audio clips, all a part of the Nike Women Truth Tour, organized by the United Students Against Sweatshops, of which SLAM is a chapter. Activists said that the visas were denied on the basis that the leaders were unable to establish proof of return. The rejection is part of a larger trend of the government denying entry to citizens of Muslim-majority countries. Their testimonies and the workers’ demands began since Nike started to pull its production from Indonesia, endangering the jobs of about 30,000 workers. The speakers stated that the company has not provided adequate severance pay to workers. “Grant us severance, following the laws and regulations for Indonesia,” several workers shown in a video montage demand. The activists also discussed NYU’s involvement with the brand in selling its apparel. Since the fall 2017 semester, Nike also provides uniforms and gear to NYU’s athletic teams. “We want to continue to amplify the workers and the work they’re doing that produces our university apparel,” a member of SLAM said. Nike has been known to grossly underpay workers in Indonesia in the past. Nike has said that it requires its factories to pay the local minimum wage. NYU is a member of the Worker Rights Consortium, a labor rights monitoring organization that has previously run campaigns against Nike in 2001, 2010 and 2015, that pushed for the sports apparel company to fairly compensate workers and allow for independent factory inspections. “We believe that Nike is not in accordance with the WRC’s standards due to its decision to pull out of Indonesia and the dangerous, inhumane and anti-union work environments the corporation fosters,” the organization’s flyer from the event reads. The speakers condemned the university’s ties to Nike and called for action. LS sophomore Adrian Brillantes-Stepper appreciated hearing about the issue from the perspective of the workers themselves. SLAM and the Asian American Political Activism Coalition plan on taking further action to work to sever ties between Nike and the university. They declined to comment to WSN. Stern sophomore Kelsey Tsuchiyama was moved by hearing the first-hand account of workers.